We expected to see donkeys and horses, but were we surprised when our guide, Maurizio promised we would see a mountain lion! Once upon a time most of the towns along the Amalfi Coast weren't connected by roads, The coastal towns were connected by boat. 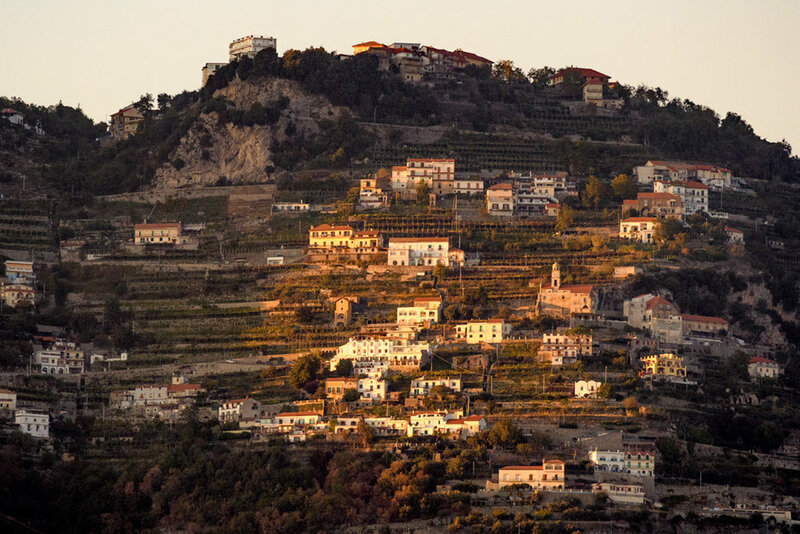 The hillside villages were connected by narrow paths and steps where people, who terraced, lived and farmed the steep cliffs above the sea. They used donkeys and horses to bring their olives, nuts, lemons and wine made from their own grapes into town. Fast forward to today, where good (if windy) roads have been built connecting most of the towns and are filled with tourist buses, and the old paths are now popular hiking trails for locals and tourists alike. You'll still see the occasional donkey or horse on the trail if you go hiking today. To see more about our trip to the Amalfi Coast see our post about Amalfi Coast here. Our guide Mauriczio from Sul Sentiero degli Dei picked us up at the dock during our Azamara Quest Cruise of the Adriatic and Italy's Amalfi Coast. He promised us a fun day, high above the coast, on the trails called "Path of the Gods." He also told us we would see a "mountain Lion", and who were we to doubt him? We started out briskly, to move ahead of a couple of larger tour groups. 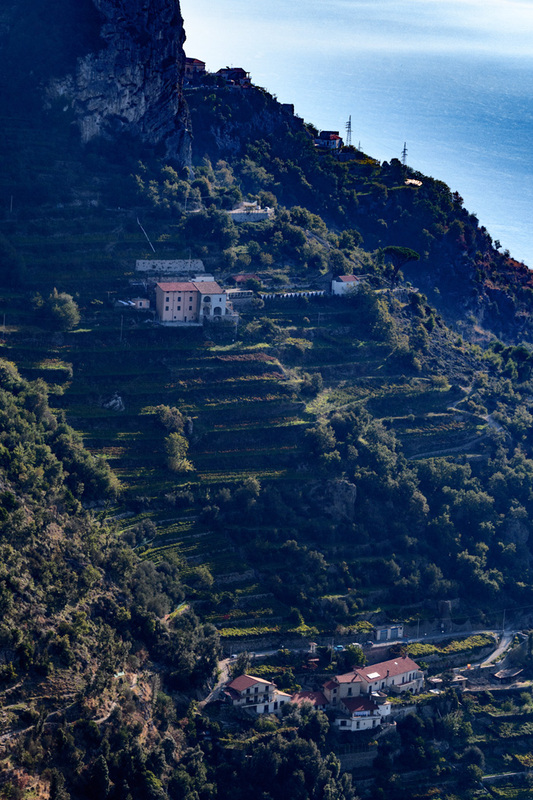 There are medieval aged buildings in the hills, where families once lived and farmed the terrace land as well as dramatic cliffs. The views down to the coast were even more dramatic, and we had to be very careful with our footing along the narrow, steep trail! Thankfully, Maurizio is a trained Mountain Rescue Guide in Italy and he warned us from the edge with stories of gory rescues he'd had to do when guests on their own made mistakes on the trail! Luckily, we are both big chickens so we kept safely on the trail! Once we were out a little further along the trail, three of us alone, Maurizio told us about the "mountain lion." Before we could get too anxious, we heard a quiet mewling and the "lion" approached Mauricio. There are several wild cats living in the hills. Most of them fare very well on their own. But the the summer of 2017, was one of the driest and hottest on record in Italy. Maurizio, who owns a small terraced farm in the hills found a nearly starved cat on his property, desperately looking for water. It had been attacked by a wild animal and was injured and near death. Because Maurizio's guiding career takes him all over Italy, he could not own a cat, but he allowed the cat to stay in his wine cellar for the hottest part of the summer, providing water, and used his first aid skills to treat the cats injuries. He gave the cat just enough grocery store cat food to build him up without making him dependent. After several days, the cats infections were healed and he started following Maurizio around everywhere, including on the trail with his clients. 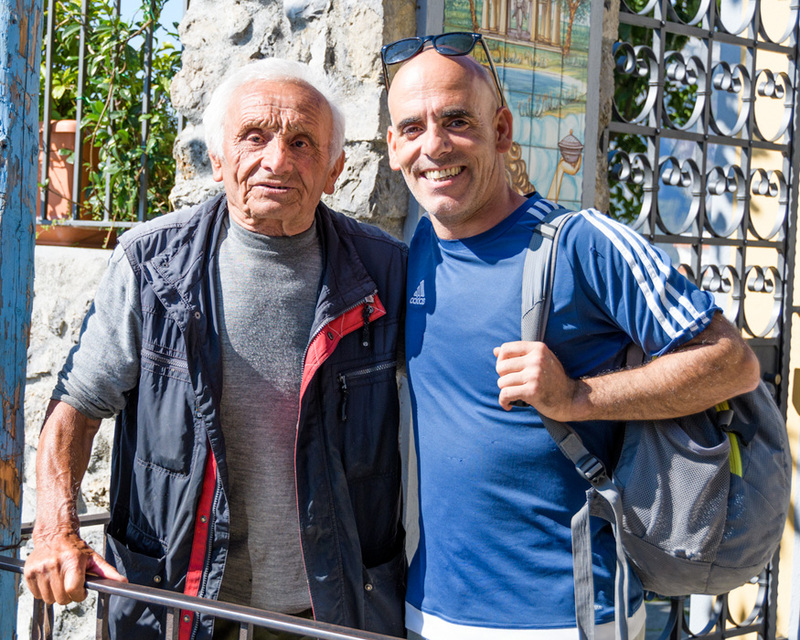 Maurizio told us he had to have a talk with the cat, telling him, " you must go back up to the hills, you can't live at my farm or follow me around anymore, but if you go into the hills again, I will always bring you some food when I come up on the trail with guests." The cat appeared to listen, cocking his head and then went off the trail, into the hills and left the guide and his guests. He wasn't seen at the farm again. The next time Maurizio went up into the mountains with clients, he had a small tin filled with cat food from the grocery store. He wasn't expecting to see the cat, but he was prepared. 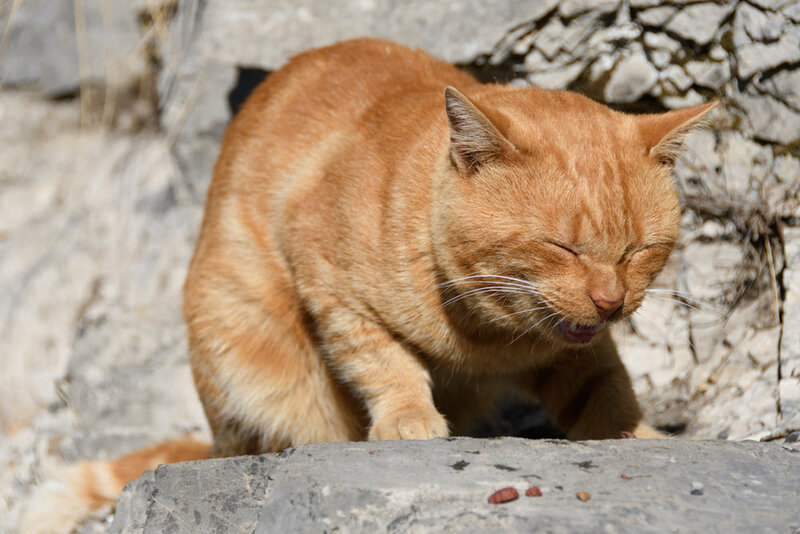 Just as he reached the place where he had left the cat with his promise, the cat appeared and Maurizio gave him just enough cat food to treat him, but not enough to make him forget how to hunt. The cat was very happy to see Maurizio and friendly, accepting pats and purring loudly. He clearly, remembered his helpful friend for more than the treats, and looked fat and happy, as cats should be!! After our heartwarming encounter with Maurizio's "mountain lion", we carried on toward the small town of Nocello, which is accessible only recently by road. There we met some local characters and saw the donkeys being used by locals to transport their goods. Maurizio suggested we take this fun anniversary panorama with ourselves on both sides! What a beautiful place to celebrate! A local in Nocello insisted me must be "pazzo" to trust Maurizio as our guide! He greeted all the guests as they entered his town and joked with the guides he knew. In fact, Maurizio is a well trained mountain rescue guide, we felt very safe with him, and he took care of our safety on the trail, as well as sharing his knowledge and love of his hometown! We arrived at the end of the trail in Nocella and enjoyed a special frozen lemon cocktail along with the fabulous view! A look back across the trail we had come. We could see the natural caves that were often used as wine cellars for people who lived in the hills! Looking toward the coast. we could see the coastal towns and small craft out in the sea. We met our driver after a busy morning hiking The Path of the Gods, feeling very fortunate that our Travel Agent from Fuoritinerio had planned another incredible day in Italy for us! We relaxed on the beach in Amalfi for a little while and we returned to our ship. 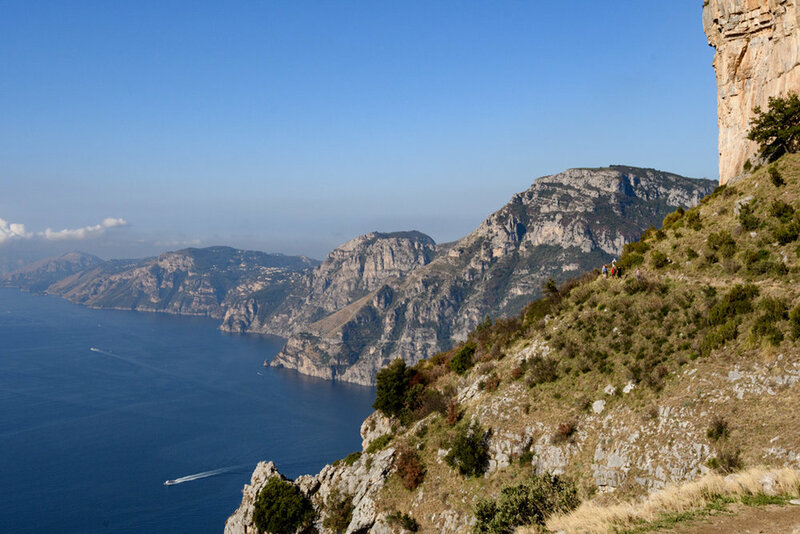 As we sailed away, we were able to identify all the towns and villages we had passed through on foot and in the car during our two day visit on the Amalfi Coast!